The first Chinese space station, weighing seven tonnes, will re-enter the atmosphere uncontrollably and will completely disintegrate by 1 April, according to the European Space Agency (ESA). "It is most likely to burn because of the extreme heat generated by its passage through the atmosphere at high speed," the agency said in a statement. 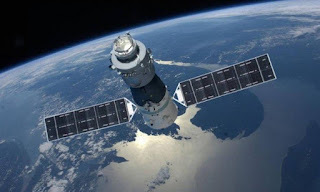 Some remains of the Tiangong-1 space laboratory are likely to fall into the ocean or on dry land, but the chances of them causing human damage are negligible, according to Stijn Lemmens, a waste specialist at the European Space Agency based in Darmstadt, Germany. "After 60 years of space flight, we have approached the figure of 6,000 uncontrolled reentry of large objects (on Earth), mostly satellites and rocket tops," he told AFP. Over 90% of these wastes were 100 kilograms or more. "Only on one occasion did a fragment strike a person but did not injure it," he said. Lemmens calculated the chances of being hit by space debris by one in 1.2 billion, 10 million times less than being struck by lightning. China's Space Program, which launched the Tiangong-1 (Heavenly Palace) in 2011, only reported on the fate of this space station, the country's first capable of harboring astronauts and designed to experiment with space-related docking technologies. The program publishes daily on its official website its downward trajectory, and its average height on this Tuesday was 207.7 kilometers. The Xinhua state news agency said on Monday, citing the Chinese space agency, that the laboratory "will burn completely as it enters the atmosphere." During its two years of operational life, Tiangong-1 participated in two missions with crew and one without. As for all satellites and large spacecraft, the station had been programmed for a "controlled re-entry" after its life, with a drop in the Pacific Ocean, far from any inhabited zone. But in March 2016, the space station "stopped working, although it maintained its structural integrity," ESA said. "It is assumed that Tiangong-1 will disintegrate during its atmospheric reentry and that some fragments will survive the process and reach the surface of the Earth,"